The InstaMorph Pigment Pack contains 0.3 ounces each of four brilliant colors: red, yellow, blue, & black. They are formulated to work especially well with InstaMorph. Only a few pellets are needed to color a tablespoon of InstaMorph. There is enough of each pigment to color an entire 12oz jar that color. 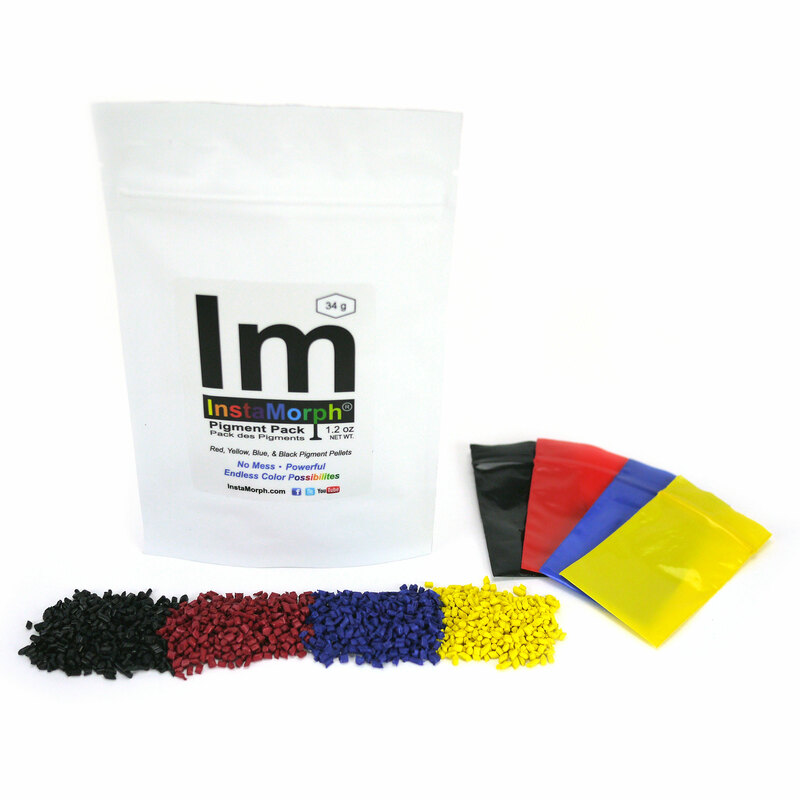 You can mix pellets to create a rainbow of different colors for your next InstaMorph project. Much cleaner than powdered color additives, as the dye is locked in the beads and only released when mixed with InstaMorph. Order your InstaMorph Pigment Pack today. The best way out there to color your InstaMorph! 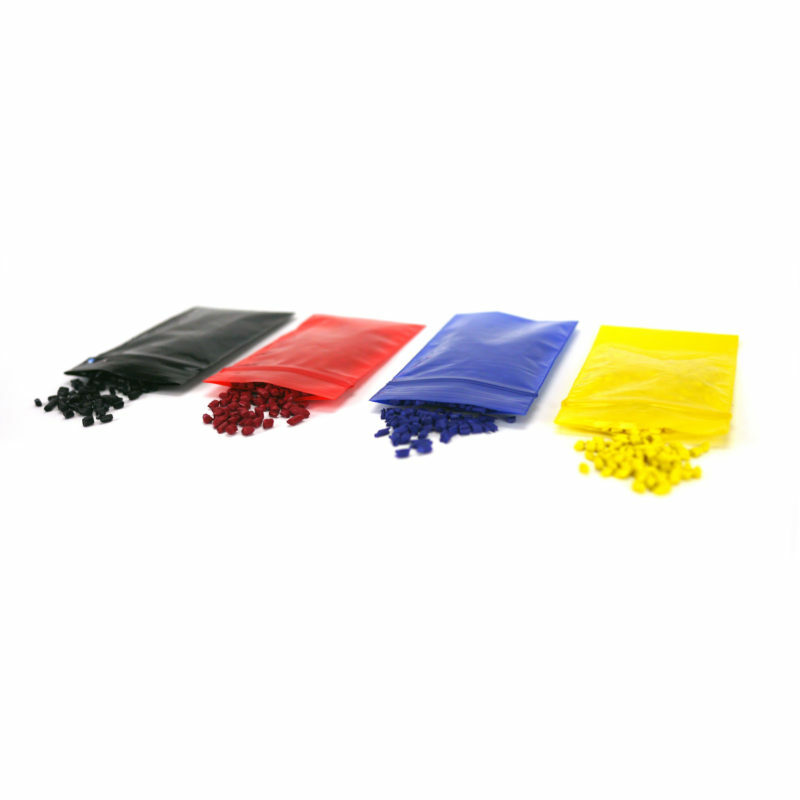 These pigment pellets have been specially formulated for InstaMorph Moldable Plastic. They are super easy to use and the results are even more amazing. Now you can take classic, white InstaMorph and easily color it to become red, yellow, blue, or black. These pigment pellets are super powerful too. With one or two pellets, you can color an entire tablespoon of InstaMorph. We’ve included enough of each color to dye an entire 12oz jar. In addition to the base colors in this kit, the pigment pellets can be mixed to create any other color in the rainbow. Want a nice green, try two yellows and a blue. How about orange, try two yellows and a red. Pellets can be cut in half for even finer grained control on the final color. See below for our handy color mixing guide. Heat some water to approximate 150 degrees F. Water can easily be heated on a stove top or in a microwave oven. (You can also also heat InstaMorph using hot air from a heat gun or oven. The InstaMorph pellets must reach the same activation temperature. Once achieved, you can skip to step 5). Pour InstaMorph pellets into the water. Now add a few pigment pellets. You’ll need 1-2 pigment pellets for each tablespoon of InstaMorph and you can mix and match for mixing non-primary colors. Wait approximately two minutes or until white InstaMorph pellets turn clear and stick together. This is when you’ll know they are ready to mold. Remove from the water and get rid of any remaining liquid between the pellets. Be sure to use tongs or some other type of tool (not your hands) as your InstaMorph will still be quite hot. Once removed from water, you’ll have to mix in the color. Do this by repeatedly stretching and folding the material. You can reheat your InstaMorph if it becomes stiff. Once the color has been evenly distributed, you can form it into desired shape for your project. Once you’ve got your InstaMorph creation finalized, let it cool to room temperature. You can place InstaMorph in ice water to speed up the setting process. 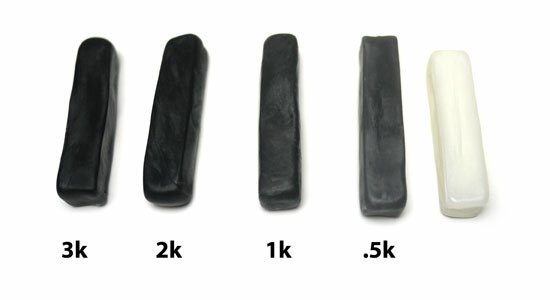 Once completely cooled, InstaMorph will then be as solid and strong as before it was heated. 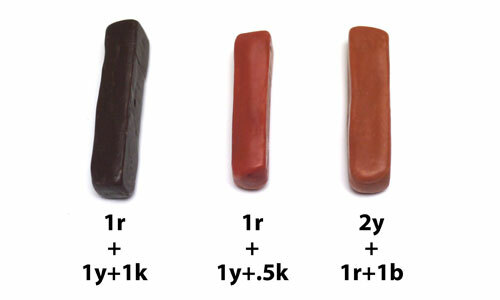 The below image show how one tablespoon of white InstaMorph looks with the following amounts of pigment pellets added. For referenece: r = red, y = yellow, b = blue, and k = black.